RUSTON – Under the mantle of ”Imprint – Marking the Next Generation,” adapted from Deuteronomy 6:7, messengers to the 2018 Louisiana Baptist Convention will learn about progress being made toward completing the goal of sharing Christ with the next generation as outlined in the President’s 2020 Commission Report. The annual meeting will take place Nov. 12-13 at Temple Baptist Church in Ruston. The next generation is one of two groups identified as target audiences in the President’s 2020 Commission Report. Adopted by messengers at the 2013 Louisiana Baptist Convention annual meeting, the 2020 initiative seeks to reach every generation and every people group in Louisiana with the Gospel by the year 2020 through congregational revitalization, church planting, communications and collaboration. Messengers also will vote on a reduced Cooperative Program budget. Approved during the Executive Board’s Sept. 25 meeting at Tall Timbers Baptist Conference Center in Woodworth, the 2019 financial plan is based on expected Cooperative Program contributions of $18,813,818, a decrease of $693,587. Cooperative Program projections are based on actual receipts from August 2017 thru July 2018. The allocation formula for distributing Cooperative Program gifts between the Southern Baptist Convention and Louisiana Baptist Convention causes remains unchanged, with 63.26 percent supporting ministries in the state and 36.74 percent forwarded to fund national entities. The update on how Louisiana Baptists are reaching the next generation and a vote on the budget are just two of a number of important items which will be addressed this year. Highlights for Monday include a Bible study by Nik Ripken, author of the book “The Insanity of God.” Also there will be a focus on the next generation in presentations by Hankins, LBC President Eddie Wren, pastor of the First Baptist Church, Rayville, and Louisiana College President Rick Brewer. Tuesday will feature messages from Jeff Ginn, pastor of Istrouma Baptist Church in Baton Rouge, Herb Reavis, pastor of North Jacksonville Baptist Church in Jacksonville, Florida, and Johnny Hunt, the newly-elected senior vice president for evangelism and leadership for the North American Mission Board. Other items on Tuesday’s agenda include; reports by the convention’s entities; updates on state missions; approval of motions and election of officers. At press time, Wren is the only known candidate whose name will be placed in nomination for the office of LBC president. 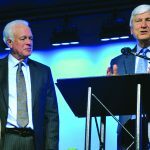 Likewise, Eddie Rhymes, director of missions for Deer Creek Baptist Association, is the only known candidate expected to be nominated for second vice president. “I always look forward to the LBC Annual meeting,” Wren said. “This year our focus will be on impacting the next generation. I think all of us are concerned about those coming after us, especially when we read statistics that tell us how many young folks leave the church year after year. New Church Reception, 4:45 p.m., Temple Baptist, Ruston.